I started looking for a ladder… still have yet to find one. I went over to the Keep. Someone was playing the harp. Nice. Looking for the ladder I went through the Keep. I found some books and a journal in the upper most room. Interesting reading. There are directions in the books for reaching other places where the D’ni people have lived and explorers have built homes and are living. One of those people has to have a ladder. I promise, I won't start trouble... really. Really. Honest. People have started keeping diaries of their time in Devokan -- just as well I bought a job lot of generic blank journals. If anyone would like to have one, send me an im and I'll get one sorted out for you, and even personalise it with your name. Some are leaving their diaries out for others to read; others are keeping them as a personal record. I woke up on Saturday to an amazing sight: the first snow of winter had fallen overnight. The trees and bushes had already been showing signs that winter was approaching, with their bare branches silhouetted against the sky, and there has been a definite chill in the air for some time, so the snow was no surprise. Over the weekend, some of the snow melted to form a pool just behind the inn. This has now frozen into a natural ice rink -- so when you visit us, dress up warm and bring your skates. While Paislee and I were talking things over yesterday, someone named AeGleh greeted us with "Shorah!" It seems that AeGleh stumbled across the GoMa site while looking for a clue to a mystery in Gahreesen (one of Andy's posts turned up in the search). Having seen the various posts about the community in this world, he decided to visit us. We had a great time. I took him across to my office at the top of the Keep, and showed him round the building. We used the village lift/elevator to get back to the main island, and then we went on an aerial tour of the village on my mini-airship, picking up Paislee and Mat on the way. We finished by flying up to Selenitica. This took some time, but the little airship did well, coping even with turbulent air pockets. Quin's ship was docked there, but there was no sign of Quin even though we shouted for him. Paislee suspected he might be engrossed in tinkering with machinery somewhere. So that was what the noise was the other day: Dot and others shouting; I had wondered what it was. However, at the time I was attempting to repair a somewhat complicated mechanism, a task calling for the utmost concentration. Some of the parts were particularly small and delicate. Be that as it may. I have now completed this first stage of work in Selenitica. The walkways are stable and safe, and enable straightforward access to the main monitoring points in the area. For the time being, I have decided not to replace the machinery in the main control building in the centre of the complex. I have no desire to have my work on it so far inadvertently destroyed by curious explorers insisting on touching every button and pulling on every lever to 'see what happens'. I can tell you what will happen: the machine will lock up, twisting and cracking the internal mechanics. I have therefore returned to the village to perform chemical analyses on the minerals found in Selenitica. I've been talking with Quin about borrowing the Devokan Flyer for an extended period. I'm wanting to check something out. He kindly agreed, saying that the nexus link to Selenitica was working well, and that he would be concentrating on analysing the crystals he collected from there over the next few weeks. So I'll be packing up over the weekend and heading off. This is going to be interesting. I'm involved in a psychological war effort to break a propaganda war and hopefully move several worlds and factions closer to a peace accord. I'll be working in one of the space stations where I have high level military access. That will reduce my time in Dovokan. I miss Devokan when away. The swan came back for a few days. I was worried about it. The little lake we like is unlikely to freeze unless Devokan gets much much colder because of the spring feeding it. But I don't know if there will be enough food for the swan. I had to decide if feeding it would help or hurt. With my commitments in other places drawing me away, I decided I should not create a dependence. Now it seems to have decided migrating was best. I'm relieved even though I miss it. The Devokan image was taken using KirstenLee's S18 viewer with dynamic shadows. A close examination reveals several render artifacts and shadow mistakes. The shadow generation code is very beta level but it is still fun for photos. Water reflections and other features are in the standard viewer. The computer console is a picture of a build by JD Llewelyn for Land of NoR (an RPG in SL that I like). 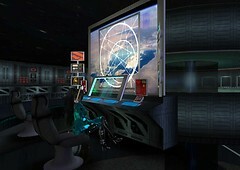 The idea of a computer surveillance screen is a possible idea for the display/promotion of fan ages within SL. When going away, why does it always take twice as long to pack up things than you had originally planned? I finally managed to leave Devokan yesterday, and I'm now on my way. I'll try to keep in touch with events on the island. Quinquifid has promised to keep track of things and post regular reports, though he does seem to be a little preoccupied with his experiments on the Selenitica crystals. Paislee had complained earlier of acrid smells wafting down the hillside and into the inn, so Quin has moved the experiments out of his house and into the Lighthouse. This is an improvement -- the offshore breeze carries the fumes out over the ocean. I'm not sure what he hopes to achieve with these experiments, but still -- it keeps him out of mischief. Dot has sent a short note: she has safely arrived at her intended destination and is proceeding to the next stage of the planned exploration. My experiments on the crystals are going well. Both their chemical and physical properties are worth studying. Some crystals emit random sequences of sounds, each with a different periodicity. I wonder whether this randomness could be harnessed in a useful way. I am beginning to be concerned about the island next to Devokan. There seems to be some instability developing there -- it is minor at present, but given this region's history this will require careful monitoring. I have placed a geostable device on the windmill island; hopefully that will give us adequate warning of major problems. In her diary in Devokan Inn, Miss Paislee mentioned noticing an odd apparition on one of the wooden walkways. Two visitors to the island have independently confirmed this strange phenomenon. Indeed, I was privileged to join with one of them in making a closer inspection. Here are their reports, first published on the MOUL forum. Met up with Paislee today, and she mentioned a "peculiarity" in the area by the island. Happened upon her and Mat again a bit later when I went to investigate. From what I overheard of their conversation, the anomaly has expanded quite a bit from the time it was initially noticed, and theoretically, may continue to do so. The anomaly itself appears as a large sphere, currently about three and a half times my height, with a swirled, slightly iridescent-seeming surface. Being the sort of person I am, I had to take a chance and try something. As of yet, I've suffered no adverse effects from passing through the sphere. Some disorientation, but nothing other than that. The surface of the Sphere does not prevent passage through it. I've made some sketches and plan to come back with a camera sometime in the next few days. Forgot it today. Hopefully, it can be contained or will cause no lasting damage. Obviously, I'm feeling a bit better, if I'm doing this sort of thing. Still need to bother Quin about taking a look at those crystals he brought back. He seems rather busy/preoccupied, though. Wouldn't want to be a nuisance. And since I know you may see this, Quin, consider this me asking. Yesterday, I finally was granted the wonderful opportunity to explore Devokan and my, what a beautiful and wonderful place. It's full of so many sights to see! Instantly I was enveloped by a sense of peace knowing that I was among fellow friends. I met Quin, Paislee, Mat and many other kind and exciting people. I took a look at Quin's experiments with the crystals. The noises they emit are quite interesting. If I recall right, Quin said there was a pattern to the breaks between noises. Outside there was a furnace of some sorts, warming some vials and slowly rotating them. The vials contained crystals dissolved in acid, hence the fumes. Hearing about the instabilities in the island, I was instantly curious to see it. Quin was happy to give me a ride in his handy hovercraft/submarine vehicle and so we ventured off to the island with little turbulence. The wonderful surprise waiting for us there was the sphere phenomenon that Holli_Tal describes in her post. The sphere gave me an odd feeling of foreboding, but one shouldn't always listen to tuition, no? My breath caught as we drove into it cautiously. Nothing happened. There was absolutely no resistance to our entry. Upon close inspection there is two spheres, one inside of the other, both rotating slowly. The size of both spheres were rather close, and so difficult to notice. Their surface was as Holli noted, swirled, slightly iridescent-seeming, and semitransparent. Blue and greens flitted across it's surface along with the occasional tinge of purple. Inside the larger sphere, was the ghost of another sphere featuring flecks of translucent white. Being inside the sphere had no effects other than being unable to see much outside and finding yourself a bit dazed. Portals made inside the sphere can be seen. In the afternoon the sphere emitted some sort of odd, constant hum. Later in the evening, no hum could be heard but upon standing outside the sphere another faint noise was heard. Inside the sphere the noise grew louder and more distinct and can only be described (I'm no good at describing sounds, someone else please give this a try) as, to put it bluntly, "creepy". The sounds were fitting to a lonely, disturbing moment in the Myst Series or perhaps a lonely planet amidst the stars...? Paislee noticed that it has grown since she saw it in the morning and that worries me. If it's growing then what ill effects with the islands suffer? We speculated on the sphere being an instability in the fabric of space. I dearly hope that is not the case. Could it be something related to what happened to Riven? Will it break apart, then collaspe? This is where the relationship between the island and Devokan comes in. Quin said that Paislee thought the islands were not a part of Devokan, but somehow they are linked. Let's hope this link isn't strong enough to affect Devokan if the island was to be harmed. I've grown quite fond of Devokan. I know you guys love to speculate. Please do so. There seems to be a fresh development today. I caught up with Miss Paislee between her chores (she was just about to make some potato soup -- very warming and filling, just what is needed in this chilly winter weather). The sphere over the walkway has shrunk a little, she feels. However, a strange ancient-looking pavilion with sides of similar material to the sphere (if 'material' is the correct word) has appeared among the trees to the north of the village. We spent a few minutes sitting in the pavilion, listening to the aetherial but somewhat unsettling 'music'(?) that fills its interior. Crystal mentioned in her report 'an odd feeling of foreboding'. I would agree. Something is not quite right here. Went to check up on the sphere at noon to find that its size has indeed shrunk dramatically. By dramatic I mean its size has decreased by more than 50%. I shuddered pleasantly thinking the danger had passed. But I don't want to let my guard down yet. It may grown to the size of the island in a hour for all I know. So presently Dot has requested that I monitor the sphere closely as Quin may...er... become too wrapped up in his experiments, and forget. I'm interested in this pavilion, though, if it's linked to the shrinkage of the sphere. Will check it out.